“Readings” of John Ashbery’s poetry have been a contentious point in critical and scholarly circles for more than half a century. It is commonly held by acolytes and detractors alike that there are only misreadings of his work, to the great delight of Harold Bloom. Stephen Burt recently wrote in the Times Literary Supplement, “When you interpret Ashbery at all, you risk having sceptics tell you that you made it all up: that the poems demonstrate ingenuity not from the poet but from his interpreters, who find music in static, meaning in randomness, synthetic silk in a succession of sow’s ears . . . No one can prove that Ashbery’s poems mean anything.” This is as good a maxim as any. John Ashbery uses language in ways that have been emphatically described as being like music, more about evocation in the reader than symbolic or essayistic communication through the text. Thus, a coherent reading per se is nearly impossible; only impressions and techniques can be described. 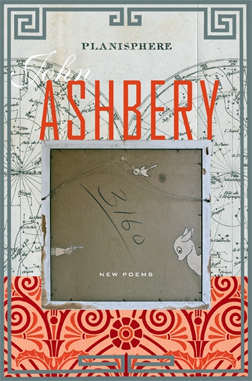 The techniques of Planisphere (Ecco, 2009), Ashbery’s latest collection, consist mainly of collage and pastiche, as well as a shifting, unstable sense of interiority that has marked his work from the very beginning.